As they say that if you make it in New York City, you will never fail to make it anywhere. Its the only city in the world where you will see the strangest kinds of human behavior on earth. Just recently a couple was caught on camera 'maliziaring' it on a bus which caused mixed reaction among social media users. This time its totally different. 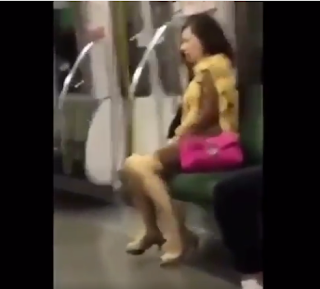 A young woman was caught on camera inside a train doing what you would normally do in your private bathroom. She didn't even care to use any kind of toy and just decided to use her fingers instead. She just decided to ignore the surroundings and get on with it. Check out the video posted on twitter.